How does the brain learn to map multi-dimensional sensory inputs to multi-dimensional motor outputs when it can only observe single rewards for the coordinated outputs of the whole network of neurons that make up the brain? We introduce Multi-AGREL, a novel, biologically plausible multi-layer neural network model for multi-dimensional reinforcement learning. We demonstrate that Multi-AGREL can learn non-linear mappings from inputs to multi-dimensional outputs by using only scalar reward feedback. We further show that in Multi-AGREL, the changes in the connection weights follow the gradient that minimizes global prediction error, and that all information required for synaptic plasticity is locally present. Rombouts, J.O, van Ooyen, A, Roelfsema, P.R, & Bohte, S.M. (2012). Biologically plausible multi-dimensional reinforcement learning in neural networks. 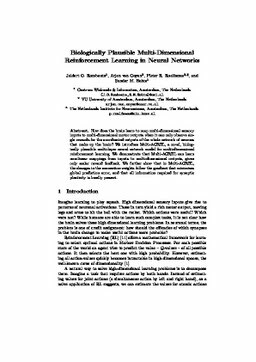 In Proceedings of International Conference on Artificial Neural Networks 2012 (ICANN 22) (pp. 443–450). Springer Verlag.